The launch of China's new State Forestry and Grassland Administration was announced on Tuesday as part of the country's institutional reform process. The reorganized Ministry of Natural Resources, which oversees the forestry administration, was also launched. In addition to the original responsibilities of the State Forestry Administration, the new forestry and grassland body will also shoulder some of the responsibilities that used to belong to six former government departments, including management work on natural reserves, scenic spots and geological parks. It will be mainly responsible for overseeing and managing the development and protection of forests, grasslands, wetlands, deserts and wildlife, as well as organizing ecological protection and restoration, afforestation and management of national parks. 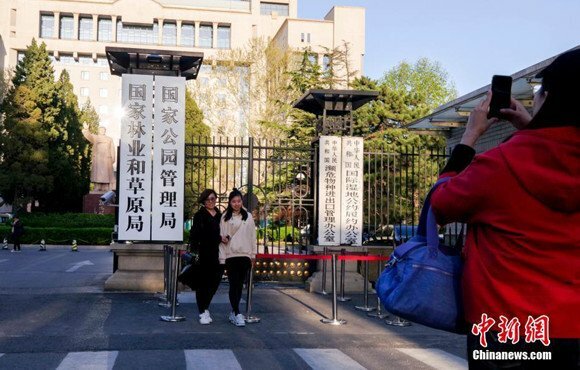 The institutional reform plan of the State Council, targeting a better-structured, more efficient and service-oriented government, was passed during the first session of the 13th National People's Congress in March. It is China's biggest government reshuffle in years and was widely seen by international observers as a move that would optimize the government's functions by promoting coordinated actions and improving levels of management and public service to better satisfy people's demands and the needs of development in a new era. The establishment of the State Forestry and Grassland Administration is a milestone toward achieving the country's modernization and social development, according to the announcement. It said the administration will play a significant role in the country's ecological recovery plan. The administration will strengthen the protection and management of natural resources and promote afforestation, according to an official, who also said that it will further enhance the function and quality of the ecological system.